Vom 31. August bis 2. 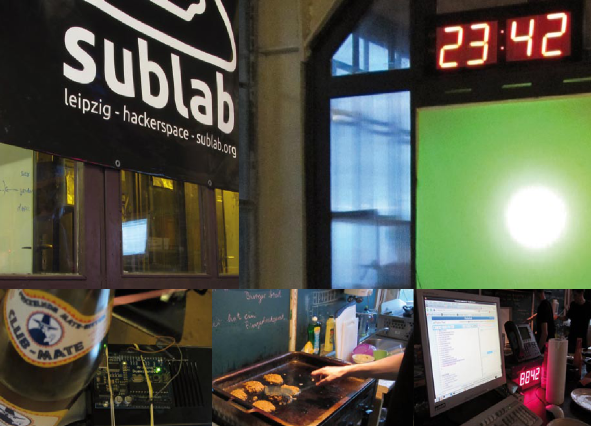 September 2012 wird die Large Hackerspace Convention III im sublab stattfinden. Die Large Hackerspace Convention Episode II soll dazu dienen, Hackerspaces und Hackerspacer aus ganz Deutschland, Europa, der Welt, unserer Galaxis und dem Rest des Universums zu einem zwanglosen Austausch zu vereinen. Gemeinsam reden wir ueber Erlebnisse und Ideen von der und fuer die Hackerspace-Bewegung. Das Event ist ultra-low-level-orga, es gibt ein loses Programm. The Large Hackerspace Convention Episode III should be exactly that. Hackerspaces and hackerspace-folks from all over Germany, Europe, the world, our galaxy, and the rest of the universe will meet for an informal exchange of knowledge. Together we'll talk about our experiences and ideas regarding the hackerspace movement. The event is organized similar to a barcamp (as in: there's not much planned in detail, really low-orga-level). There will be an approximation of a program but we're still working on that. As every year dangerously large fans are welcome. There will probably be talks and some workshops and you're invited to hold one yourself. If you need any special equipment please contact us in advance and we'll try not to forget to organize it. As Leipzig is the location of Germany's national library we'll take a trip to the recently reopened Deutsches Buch- und Schriftmuseum on Saturday. Cooled drinks containing an adequate amount of caffeine are available and there are some snacks. A breakfast buffet will be provided at nerd compatible times and our excellent kitchen slaves from the Phantomspeisung will create lavish and vegan dinners. Additionally, there are multiple supermarkets conveniently located around the sublab. Most necessities are provided (internet, power, soldering equipment, sleeping space). You can either crash in the space itself (no guarantee for quiet) or in a separate room in another wing of the building. In all cases indoor camping equipment is advised (mats and sleeping bags). There are some members living in walking distance where showering is possible.